Cornish Gilliflower - Apple Tree £12.75 - Dessert Apples - Late Season Apple Trees and Fruit Trees For Sale. Buy at competitive prices with wholesale discounts. This classic Victorian English eating apple has a rich, sweet aromatic flavour with a clove-like fragrance when cut. The variety is widely known for its attractive pink ornamental blossom and its irregular, oblong shape. 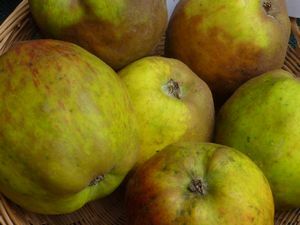 It is considered to be a high quality fruit and is certainly the most popular and widely grown dessert apple to originate from Cornwall.